TEXAS TRISH FM 276 -- F. M. "Blacky" Graves was known during the seventies and eighties as the nesting place of many of the original Butler cattle. He did deals with Milby Butler, Henry Butler and Pauline Russell to acquire many of the foundation Butler cattle. Most of his cattle were named "Graves" or "Miss Dayton" were unknown sire and or dam and some had one or two known registered parents. This was the time of a lot of unregistered cattle. He had best of all early Butler bulls Classic, and he also had Monarch, Bold Ruler, Man O War, Conquistador, New Sam, Pecos, Dode's Boy, etc. Blacky Graves consigned pretty white cattle with very good horns to the sales and fetched the highest prices of the industry. In the early eighties he sold dozens of his all Butler cows for $10,000 to $50,000. Seldom ever did he buy in sales and if he did it was a hamburger low price. He never advertised during his whole career up until his dispersal sale. F. M. "Blacky" Graves of Dayton, Texas was the strongest breeder of 100% Butler cattle. His signature white Butler cattle were breed leaders in that time. Most people thought the Graves cattle were 100% Butler and most were. About once a year he would buy one or two bargain cows from partners or close friends at auction. The odds of him ever paying over $500 for any registered cow is close to zero. Graves acquired Miss Redmac 24 who was sired by Peeler Remolino 556 and the breeder was the YO Ranch. She was AI bred to Texas Ranger JP, an all Phillips bull, and produced Texas Trish FM 276. Graves was the owner of Texas Trish, his first and only Texas Ranger daughter and the breeder is recorded as Charles Schreiner IV. 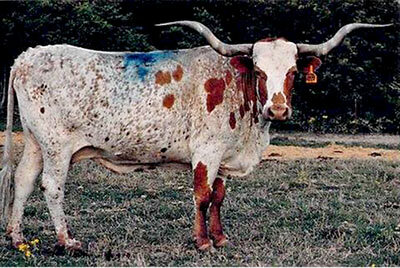 In 1997 W. O. Marquess was doing Texas Longhorn embryo transplants at Ben Wheeler, Texas and did a percentage deal with Graves to flush some of his cows. W. O. selected Texas Trish as his choice of the Graves cows for flushing. She was a tall thick Texas Ranger looking cow and the largest in the Graves pasture. She weighed between 1250 and 1400 lbs. The Graves Butler herd were very feminine and pretty cows, but small and fine boned. Once when I had used the famous bull "King" and had replaced him with his son Zhivago I called several producers and offered "King" for sale. I told Graves that the ton plus size and 64" T2T of "King" would be a wonderful cross on the small Butler cows. "King" was red and would reduce the white colors possibly getting very spotted progeny with horn and size. I thought it would be a perfect blend. He declined the offer and held strong with the Butler bloodlines. I sold King to El Coyote. When W. O. flushed Texas Trish to the Johnny Hoffman bull Dixie River, by Emperor, the result was a cow with size, beautiful chocolate specks and a 85.75" T2T. One of the greatest cows of all times -- Royal Reputation -- F. M. Graves is the breeder. She was purchased by R. E. Carroll Ranch at the Legacy IV sale for $150,000. This Texas Trish daughter, Royal Reputation, is one of the 6 highest selling cows in history. She was the most valuable of all embryo transplants from the W. O. Marquess laboratory. She was the most valuable cow ever bred by F. M. Graves from hundreds raised by him. She was a triple line bred Texas Ranger J P cow. *For more history on F. M. Graves order the eBook from Amazon FILLET OF HORN II.